There are about 78 million pet cats in the United States, and about 48 million of them are allowed to roam outdoors. At least as many stray and feral cats run wild. Most pet cats don’t kill many birds, but even small numbers can add up when there are so many cats. And some individual cats kill a lot of birds. On an early October morning during a heavy migration period, I found seventeen dead Yellow-rumped and Palm Warblers on the ground in a two-block area in my neighborhood; as far as I could determine, all had been killed by a single cat. Dr. Stan Temple of the University of Wisconsin estimates that in Wisconsin alone about 7 million birds are killed by cats each year. The American Bird Conservancy estimates that cats kill hundreds of millions of birds in the United States each year and about three times as many mammals, which significantly reduces the prey base for raptors and shrikes. Some populations of birds are more susceptible to cat predation than others. 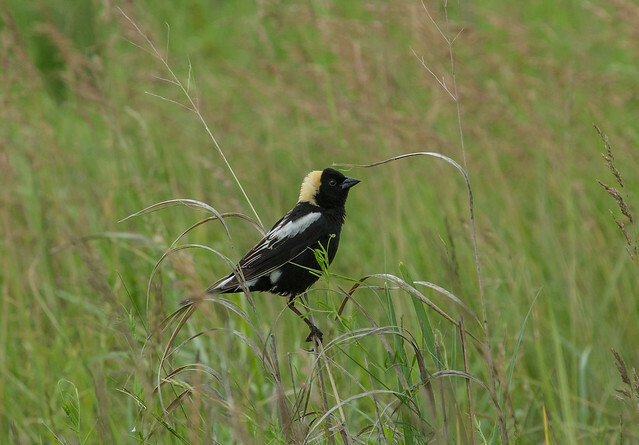 Bobolinks, meadowlarks, and other grassland species that nest on the ground in agricultural areas are especially vulnerable to farm cats. These species are declining for a number of reasons, but cats are certainly one of the major causes. Sometimes people “rescue” birds from their cats, but these birds are almost invariably doomed. I was a wildlife rehabilitator for many years and took in a wide variety of birds that had been injured by cats. To the unpracticed eye, many had no apparent injuries because feathers can hide not only puncture wounds but also tears, gashes, and blood. One woman brought me a White-breasted Nuthatch that she had taken from her cat. She thought it had lost only a few tail feathers, but beneath the belly feathers, I saw in horror that the entire pygostyle (the fused vertenrae pf the tail) had been ripped out, along with skin, muscle, and a chunk of intestine. 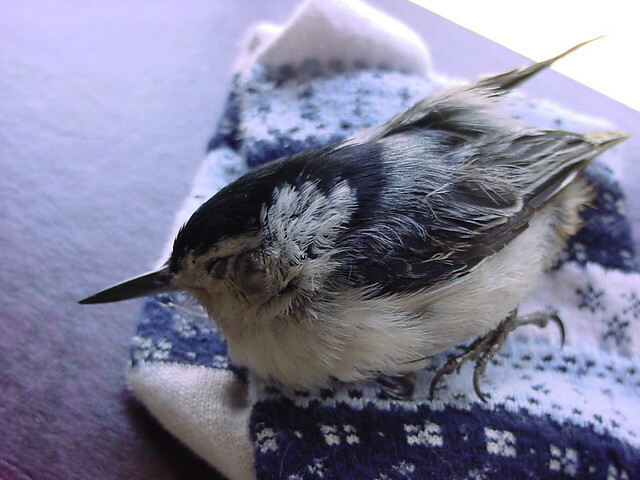 The nuthatch was in shock, and I held it as its life ebbed away. Meanwhile, this woman drove home feeling virtuous for “saving” this little creature and continued to let her cat outdoors. Another person brought me a female Evening Grosbeak that had been mangled by a cat. One wing was broken, and to anchor it in place as it healed, I put a wrapping around the bird’s middle and taped the broken wing to that. I administered antibiotics, and after a day or two, she started eating well and looked perky. I grew attached to her during the ten days I cared for her as she mended. But the day I took off the bandages, she took a deep breath (as if relieved to get the burdensome wrappings off), opened her wings for a practice flight, and keeled over dead. Apparently the cat had broken several of her ribs. With the bandages in place, the bones remained immobile, but when she opened her wings, the broken bones punctured her lungs and killed her. Unlike our lungs, bird lungs are flat and situated just below the back ribs. Most of the volume of air that a bird breathes in and out passes through the lungs into huge balloonlike air sacs that fill much of the abdomen, part of the neck, and various spaces in between. When a cat reaches out and claws a bird’s back or bites into it while carrying it off, the lungs are invariably damaged. And because cat saliva is rich in bacteria, cat bites are prone to infection. The vast majority of cat-injured birds I cared for ended up dying. Cats are predators by nature. But unlike foxes, coyotes, hawks, owls, and other wild predators, we subsidize cats, providing them with food and shelter and taking care of them when they’re sick or injured. On a single suburban block, three or four cats might thrive, whereas a family of foxes would require far more space and would either move on or die out when they depleted their prey. Even the most well-fed cats have a natural instinct to chase and toy with birds and rodents, and the fitter a cat is, the more effective at killing it becomes. But killing for a living is hard for domesticated animals. Outdoor cats can be killed by dogs, foxes, or other predators; or contact serious diseases such as feline leukemia. 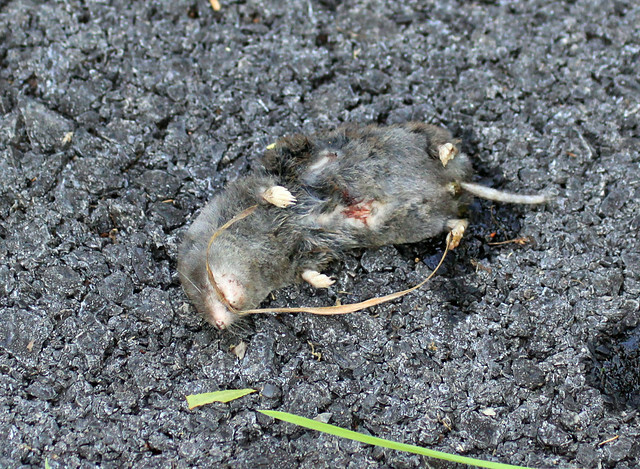 In urban areas where rats and mice pose a serious risk for human health, rodents convulsing after consuming poison may entice cats to finish them off, poisoning the cats as well. 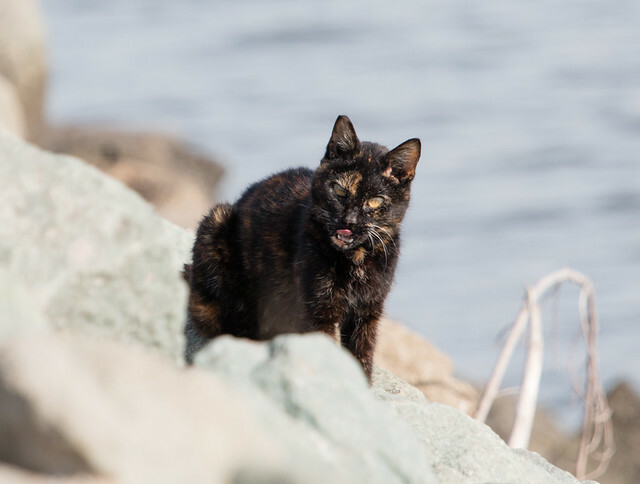 Roaming cats are also subjected to some of the same natural hazards that wild animals are. I’ve heard several stories of Great Horned Owls and large hawks killing or wounding cats and small dogs. Cats allowed outdoors live, on average, only three to five years, compared with more than fifteen years for indoor cats. People often romanticize the wild nature of their cats, but I’ve taken in four cats that I rescued as strays, and all four seemed perfectly content to stay indoors. 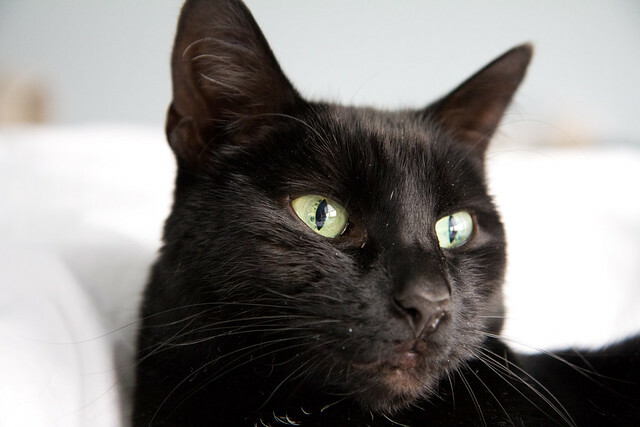 Animal welfare groups and the American Veterinary Medical Association recommend keeping cats indoors. Cats that toy with or feed on wild birds and mice are most likely to carry toxoplasmosis, a protozoal infection that is extremely dangerous for unborn babies and newborns. Cats prefer to defecate in loose, sandy soil, so they often use sandboxes or cultivated gardens, exposing small children and gardeners to their droppings, which harbor the infectious organisms. Some outside cats are so set in their ways that they really do become distressed when confined indoors. If you choose to let your cat outdoors, keep it harnessed or leashed. There are also enclosed kitty pens with complex pathways that allow cats to feel like they’re on the prowl outdoors without giving them access to birds. And designers of “invisible fences” are now creating models specifically for cats. If you witness a neighborhood cat killing birds, find a courteous way to inform the owner and ask that the cat be kept indoors. At least suggest that the cat be kept inside during baby bird season and major migration events or that it be let out only at nighttime. 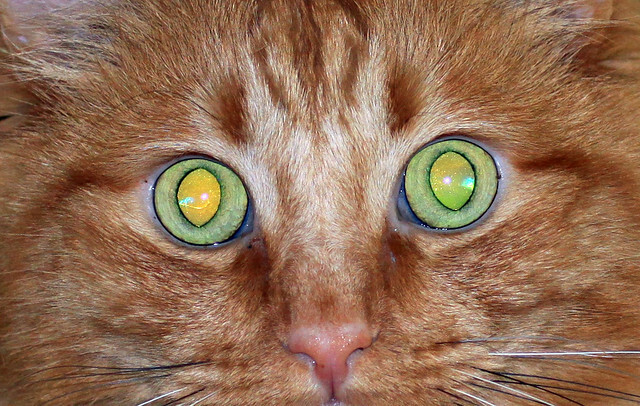 Cats usually hunt visually and kill mostly rodents at night.